Gear-O-Rama Supply Ltd. | Truck & Trailer Parts - Gear-O-Rama Supply Ltd.
Our trained parts technicians will help you find the right parts you need - when you need them. To ensure the success of your business we carry a large inventory of International OEM parts as well as a large inventory of parts for All-Makes. We stock parts for new & used heavy duty trucks, buses and trailers. If you are looking for a part we don’t have, our experienced team of professionals are dedicated to sourcing the part for you from one of a large number of vendors we work with. 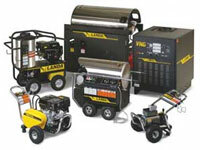 Whether you are looking for a cold water or hot water pressure washer, gas/diesel or electric, portable or stationary we can help you find the right Landa washer to fit your needs.